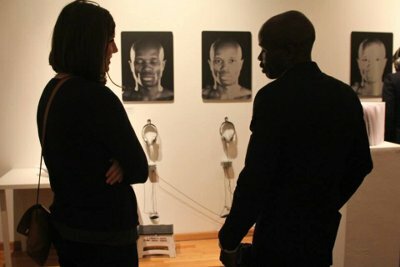 Folleh Tamba speaking to a visitor at the May 2014 thesis exhiition about his work. What is War? is an international collection of Veteran Art and Literature assembled with the intention of providing insight into the impact of wartime experience, and service-related trauma on the human psyche. Presented by the 555 Collective and the Cheyenne Center for Creativity, the show officially launches the development of a permanent memorial to be housed within the 555 headquarters in St. Francis, Kansas. Featuring work by Malachi Muncy, Giuseppe Pellicano, Neil Leinwohl, Mark Pinto, Mike Dooley, Ron Whitehead, Phillip Schladweiler, Brian Rock, Erica Slone, Jesse Albrecht, Orlinda Marquez, Paul Bouchard, Steven Liveoak, Nick Dalrymple, Ray Funderburk, and more – the exhibit will be housed in the Cheyenne Center’s Quincy Gallery from May 24th-August 1 2014. A few blocks away, development of the 555 headquarters has already begun, which is scheduled to exhibit a single artist installation some time in early June 2014 (by the interdisciplinarian, art and media artist, Folleh Tamba, recent graduate of Columbia College in Chicago, MFA). St. Francis, Kansas is approximately three hours driving time from Denver, 12 miles east of the Colorado border. A commercial for a chain restaurant I saw today, while contemplating Posttraumatic Stress Disorder. I was born in the USA. I was taught that Long Duck Dong was representative of foreign cultures. My dog eats better than about 30 percent of the Guatemalan population. But that’s okay because I love my dog more than most people I encounter in this country. My dog loves me. She does not judge me. I have witnessed and endured an enlightened suffering, both physical and mental, that undermines everything I have ever been taught about existence, my place within its greater scope, and any hope I was ever given that led me to believe life is relevant, or significant, or worth one more second of this seemingly infinite agony called consciousness. I saw an ancient beauty ripped open and devoured by a culture dominated by preening, egocentric monsters – into which I have been reinjected like antiheroin – like the nightmares that have been downloaded into my mind. And so here I am. You cannot see me. I feel so very alienated. What is War? The conundrum is not simply posed by the question, but within the elusive nature of its answer lies the very essence of mankind’s suffering. What if we simply asked, “What is Blue?”, and sent out a call for entries? They say that environment shapes genetics, and that as humans, what we become amounts to about half one and half the other. What this means is that half of who we are is comprised of our experience on this planet. The other half is programming. What is War? is an art show designed to provide a multi-perspective answer to the question – to allow those of us who have no idea to begin the slow process of understanding – to provide an opportunity to see how trauma has affected the men and women of our nation’s military. There have been 2,000 veteran suicides since January 1, 2014 because we cannot see – we will not see – because our experience and our programming does not compute. The first step to understanding another human’s suffering, is to simply see it. To open our eyes. The 555 Collective publishes an online magazine and conducts arts related projects that generate support for humans who suffer from trauma related issues. Founded in 2010 by K. Joseph Carman, the 555’s mission has been enacted through projects such as Tattoo-Haiku (a haiku contest that benefits homeless veterans), Shell-Shock (an ongoing ammunition recycling campaign), and of course, What is War? For more information, please consult the 555’s online magazine – 555c.org. *If one veteran committed suicide since January 1, 2014, this is too many. And herein lies the problem with us all. Ego>Empathy.